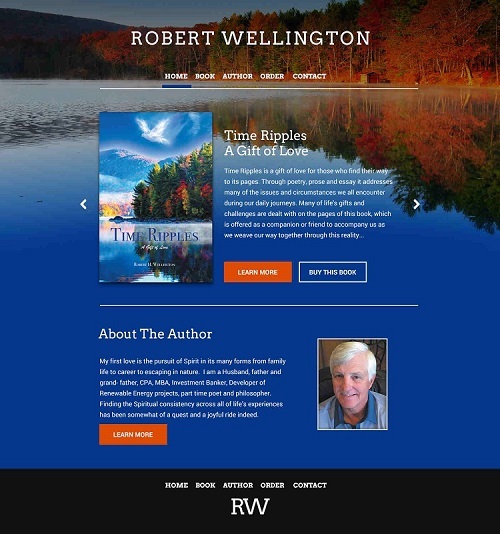 LEXINGTON, MA, UNITED STATES, July 12, 2018 /EINPresswire.com/ -- Author Robert Wellington’s two books, Water Wisdom, A Journey of Discovery and Time Ripples, A Gift of Love have earned a tip of the hat from many online followers. His website not only flashes joyful colors that exudes positivity, while his books are an inspirational guide for the soul. It has also received tweetable praise for its simplicity and book coverage, including the author’s positive thoughts and quotes. Here one can most easily interact with and touch the threads of reality. We can also see God’s loom, endlessly weaving together the dynamics of creation with the peace of infinite potential. Wellington is a sharer of goodwill through his essays, poetry and poignant account of his own personal journey that transcends to the lives of his readers..
His website is a social media attraction for people who seek better understanding about life’s meaning and journey. An online community that brings people together, sort of a fellowship online. Prayers and meditations can lift even the most tired soul and bring zest back into one’s daily routine . For many readers, his books seem to magically do just that. Join us at www.time-ripples.com.